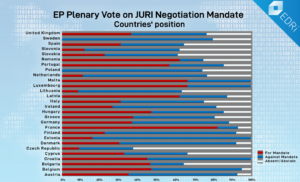 EP Plenary on the Copyright Directive – Who voted what? Many of you have been wondering who voted for and who voted against JURI’s mandate to enter into negotiations with the EU Council on the Copyright Directive on 5 July. We prepared a summary with the most relevant data for you to understand the EU Parliamentary dynamics. France led the voting for the mandate with 82.43% of the MEPs voting against our campaign and in favour of starting negotiations with the EU Council. Luxembourg and Malta also voted mainly in favour of the mandate (66.67% of their MEPs each), same as Romania and Latvia (62.50%) and Portugal (57.14%). On the other side, 83.33% of Estonian and 80% of Swedish MEPs voted against the mandate. Other countries that mainly opposed it were Poland (74.51%), Finland (69.23%) and the Netherlands (65.38%). It is also remarkable that a large number of MEPs abstained or were not present at the vote, with percentages close to or greater than 30% in countries such as Slovakia, Czech Republic, Lithuania, Spain or Bulgaria. 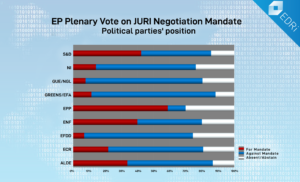 With regard the political groups, the European People’s Party (EPP) and the Progressive Alliance of Social and Democrats (S&D) were the ones voting in their majority for the entering into negotiations with the Council , with the 58.90% of the votes of the EPPs in favour (129 MEPs) and the 42.33% of the S&D (80 MEPs). Compared to EPP, a slightly higher percentage of the S&D MEPs voted against (43.39%) the mandate. On the other side, the political groups voting overwhelmingly against entering into negotiations were the Group of the Greens-European Free Alliance with a 79.92% of the votes, followed by the European United Left/Nordic Green Left (GUE/NGL) with a 72.55% of the votes and the Group of Europe of Freedom and Direct Democracy with a 67.44% of the votes. The next voting on the Plenary with the introduced amendments will take place on 12 September.